Although the South might be known for heat and humidity, Atlantans know how to keep cool during those hot days of summer. Use the itinerary below as a guide to beat the heat like the locals. 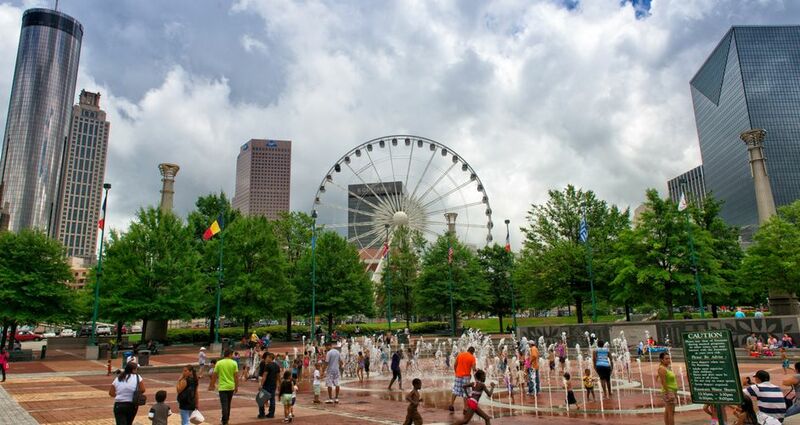 Morning: Centennial Olympic Park is home to an interactive splash pad incorporating the Olympic Rings symbol. With 5,000 gallons of water recycled through the fountains per minute, it is enough water to keep visitors soaked and entertained. Enjoy Georgia Aquarium’s AT&T Dolphin Tales show and watch as dolphins and trainers perform amazing feats in the indoor arena. Sit up close in the splash zone to receive a cold rush of water courtesy of a friendly dolphin. Afternoon: One of Atlanta’s most popular swimming spots, Grant Park Pool, is a great place to keep cool with a big blue awning for shade and a “splash spot” for the kids. This zero-entry style pool lets swimmers ease their way in. Or, head a few miles north to spend a day in the refreshing waters of the Chattahoochee River. Shoot the Hooch has everything from kayak and canoe rentals to inner tubes for a lazy river experience. Evening: The Painted Pin is an upscale boutique bar, bowling and entertainment venue with 20 full-service lanes located in an industrial warehouse space in Buckhead. Sip drinks, indulge in dinner and play games like bocce ball, darts and more. For a more laid back experience, enjoy the latest blockbuster film with dinner, drinks and reclining chairs at Cinebistro at Town Brookhaven. Stay: Relax at the 16th-floor pool at the W Atlanta-Downtown. This outdoor pool features open-air glass walls that offer amazing views of the city. The St. Regis Atlanta offers an oasis in the Buckhead neighborhood with a 6th-floor pool piazza equipped with a waterfall. Visit www.atlanta.net/things-to-do/ for even more things to enjoy in Atlanta.